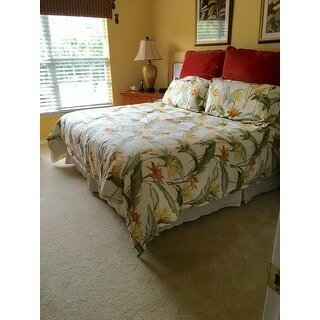 Love this Tommy Bahama Bird of Paradise King size comforter set. I have drawers at the end of my king bed underneath so I am making valences for my windows out of the bed skirt that matches the Bird of Paradise set. Yes I would recommend to a friend. Very happy with this purchase. 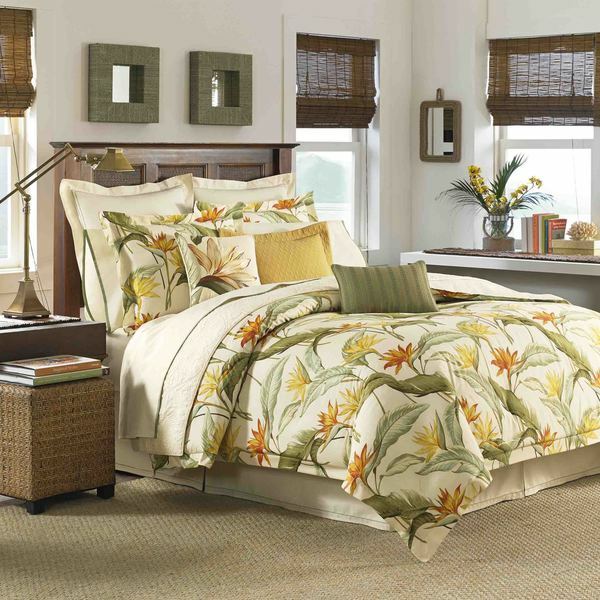 Tropical and soothing, this 4-piece comforter set will bring a bit of paradise into your home. The set includes one comforter, two matching shams and a coordinating bedskirt. The sateen cotton shams and comforter feature a tropical birds of paradise design in greens, oranges and yellows over a muted coconut background while the reverse side displays a textured print. I would never have paid full price but considering the sale price this is a great comforter for the price. The colors are perfect and it seems to be well made. For me the bed skirt is useless wish it was a couple of inches shorter or my box spring a couple of inches bigger. This is the first comforter that we have had in many years that is actually made for deep mattresses. It fits our bed perfectly! I must also say that I love how cozy I feel with this comforter. I am usually too hot at night. Our previous comforter was very thin and I was still throwing it off all night. This Tommy Bahama comforter is just fluffy enough without being heavy or too warm. I am sleeping better than I have in a long time because I am not constantly too warm or too cold. I just snuggle in and sleep peacefully. Now I know how Goldilocks felt when she found something that was just right! Bottom line: I'm pleased with it, particularly for the price I paid, and I would purchase it again. I really like this pattern: tropical, simple, and not overloaded on color or pattern. Just right (said Goldilocks). I had been eyeing this pattern for more than a year. I live in Florida and wanted something more tropical that would also help lighten up my bedroom. The only thing I wish were different is the stitching across the comforter, tying down the filler/padding to the top and bottom covers. There is "some" stitching to help keep it from completely sliding within the cover, but I had expected it to be similar to my last Tommy Hilfiger comforter, with a criss-cross pattern across the entire cover. Even so, it seems to work. And at the sale price, it was a good value. So even though I'm not 100% pleased, I think it still deserves five stars. I am pleased with the quality, and it's big enough to fit comfortably across a queen mattress--on all sides (sometimes you feel as though maybe what is advertised as a queen is really for a double--not the case with this one). The interior padding is thick but lightweight. Any noticeable wrinkles seem to work themselves out once its laid out flat on the bed. (I don't have a steamer, so I spritzed some water lightly across it then turned on the ceiling fan.) A bit of Febreeze and some airing out removed the initial packaging smells by the next day. I absolutely love this duvet set. Brings a bit of the islands into one of our Southwest Florida homes. Well made and true to color. We purchased a king set. I had my eye on this comforter set for a while looking at different stores online that also sold it since it was more than I wanted to spend. Overstock had the best price by far. This was my first purchase using Overstock and it was shipped out the day after I ordered it.The comforter is high quality and looks fabulous in my tropical-themed bedroom. Very satisfied. I love the set. I ordered a queen size and I have a very high bed, but the comforter is actually larger than any one I have had before. The colors are bright and vibrant. Couldn't be happier. This is a very warm, cozy comforter set. I tend to prefer natural fibers so the cotton fabric was a big selling point for me. However I live in Arizona so it is just too puffy and warm to actually sleepunder here in this climate. Also, the colors are muted which is a good pallet for restful sleep but I had envisioned a sleeker, more vibrant look. So I am returning this set. This Tommy Bahama Birds of Paradise 4-piece Comforter Set turned out to be excellent quality, the colors actually were more impressive in person than they were in the picture. This purchase definitely will get 5 stars from me. The comforter is not what I would have expected from Tommy Bahama. The foam bunches up on the ends and is hard to even it out. This is my 2nd Tommy comforter and it will be my last. Loved the colors but the workmanship is horrible. The filing bunched to the bottom. The stitches are uneven. Certainly not worth the money. Big disappointment! Ample size for queen size bed; however, tacked down in too few areas to hold the filling firmly in place. Also, the material wrinkles easily. I like the pattern, but the quality is disappointing. When I took the comforter out of the package and put it on the bed it looked like it had been crumpled in a washer or dryer for days. I sprayed it with a fine mist and tried to smooth out the wrinkles with a cool iron. It was hard work and although it looks a lot better, it still has too many wrinkles and there are places where the batting seems bunched. I will return it. My husband says that Overstock sells "seconds" so I should not be surprised. I am very disappointed. Highly Recommend - It's Bright, It's Soft, It's Prefect!! Packaged for perfect arrival. Comforter set is beautiful and I just love it. It is the perfect weight for me, not overly warm but nice and thick for when I need it. I also love the matching cases and bedskirt. Even better looking in person...vibrant colors! Love my Tommy Bahama comforter set! Colours are as shown, quality is good. I am very happy with this set. This set looks great and the quality is very good. I would recommend this set. Love it, it looks great, but I haven't figured out how to make it look less wrinkled after I wash it. I'll go with a comforter and duvet cover next time. Have used this comforter for several months now and it has held up very well. It still looks new even with 2 cats that lay on it and pick it occasionally. I am very happy with the quality. "Do you have the comforter in twin size?" No, this is not available in twin size. "Where can I purchase the euro shams & throw pillows pictured in this set"
"How do you get the light colored pillow shams behind the ones that come with it ?" I didn't buy any of the lighter colored shams. I didn't see that they even offered them. "Are there curtains that come with this set?" No,there are no curtains matching this. "Are the shams that come in the set the print or solid"
"I would like to order the green and gold (yellow) decorative pillows that go so nicely with the Tommy Bahama Comforter set"
205559 Birds of paradise CCN 16X20 diamond step brk pillow. 205560 Birds of paradise CCN 12X16 wavy striped brk pillow. "does the mattress have to be removed in order to put on the bedskirt?" Yes you have to remove the top mattress or lift it up to put on the bed skirt.